Dolce & Gabbana to 5th, by Lois Weiss. 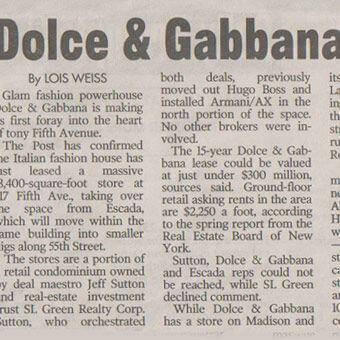 Glam fashion powerhouse Dolce & Gabbana is making its first foray into the heart of tony Fifth Avenue. The Post has confirmed the Italian fashion house has just leased a massive 18,400-square-foot store at 717 Fifth Ave., taking over the space from Escada, which will move within the same building into smaller digs along 55th Street. The stores are a portion of a retail condominium owned by deal maestro Jeff Sutton and real-estate investment trust SL Green Realty Corp. Sutton, who orchestrated both deals, previously moved out Hugo Boss and installed Armani/AX in the north portion of the space. No other brokers were involved. The 15-year Dolce & Gabbana lease could be valued at just under $300 million, sources said. Ground-floor retail asking rents in the area are $2,250 a foot, according to the spring report from the Real Estate Board of New York. Sutton, Dolce & Gabbana and Escada reps could not be reached, while SL Green declined comment. While Dolce &Gabbana has a store on Madison and its lower priced D&G line on Lafayette Street, the designing duo has never cracked the key luxury shopping stretch of Fifth Avenue that runs from 57th Street to Rockefeller Center. Rather than joining the mass retailer pricing of nearby Forever 21, Uniqlo, Abercrombie & Fitch and H&M -- the latter two of which Sutton also installed -- the new Dolce & Gabbana store will be pure luxury. Escada will close its current store by the end of the year and reopen when its new 10,000-square-foot space is complete.